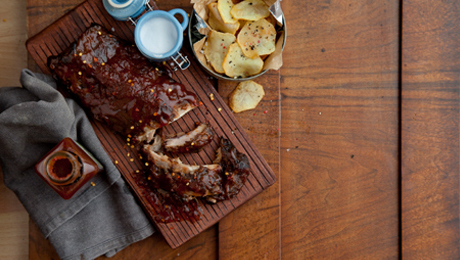 Delicious Bacon ribs topped off with homemade potato crisps! Half fill a deep baking tray with water, then add the onion, carrot, herbs and seasoning. Lay the racks of bacon on a wire rack and place in the baking tray and cover with foil. Place in a preheated oven and bake for 40-45 minutes, then remove the foil and pat the racks dry with some kitchen paper. Meanwhile warm the sauce in a small saucepan and add the water. Brush the glaze onto the racks of bacon, you could add some chilli flakes too if you like a spicy kick to your ribs. Finish on the barbecue to get an enhanced flavour, continuously basting with the Kitty O’Byrne sauce. Drain potatoes. Bring to boil the water with the vinegar, over high heat. Add the potatoes and cook for 3 minutes maximum. Immediately drain in a colander and spread on paper towel. Allow to dry for a few minutes, moving potatoes around to get even drying. Meanwhile, preheat a deep fat fryer to 160˚C. Add 1/3 of potato slices and cook, stirring and flipping constantly with a slotted spoon until potatoes release no more bubbles, about 4 - 5 minutes total. Transfer chips to a large bowl lined with kitchen paper, sprinkle with Irish BioSalt and toss to coat. Repeat the remaining batches of crisps and serve immediately - enjoy hot!